I follow a Facebook page of antique quilts that recently featured a few New York Beauty quilts. I love that many of them are NOT flawless. There are imperfections, just like the one above. 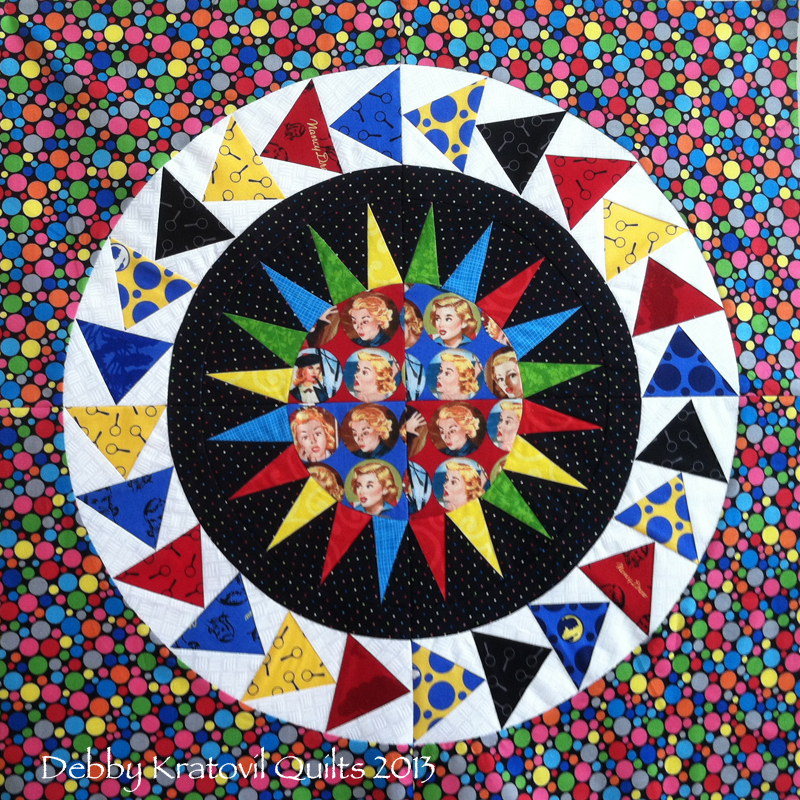 I had wanted to include this quilt in my recent book Paper Piecing Perfect Points and had asked a fellow teacher about quilting this for me. She insisted that I take it apart and "fix" the flaws in the side spikey borders, in particular, the one on the left. . . And I did (take it apart) 3 years ago! And it still is in parts. All the paper pieced parts. All sorts of parts and it has broken my heart. Sits in a dark box in the basement. Never did "fix it." I'm going to the basement this morning. Find the box. Take it to my sewing room. Sew the parts back together JUST LIKE THE PHOTO. And I will make sweet promises to the quilt that she will get quilted JUST LIKE SHE APPEARS and will take her around and show her off JUST LIKE SHE IS. Yes, my friend meant well. We quilters are perfectionists. I get it. But life is too short to try to be like God. Holy cow! I really don't want to compete with Him. We know what happened to that angel who tried that millenia ago! I'll keep you posted on that quilt. Meg comes over with Audrey occasionally when Audrey wants to sew and raid my stash. 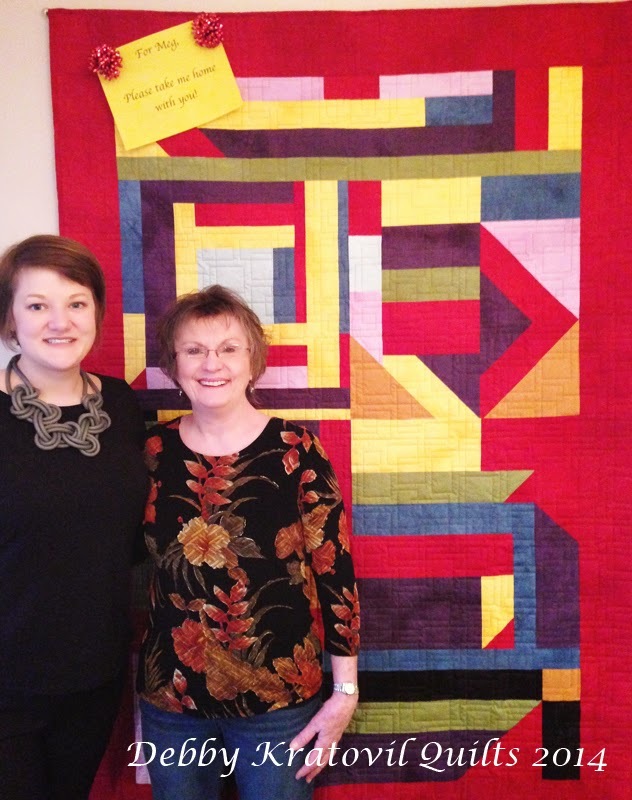 Meg saw my unfinished Gee's Bend quilt last year and thought it was the most beautiful thing she had ever seen (as far as quilts go). I knew then that it would find a home with her. I had to query about 200 quilt shops to find the red for the borders. 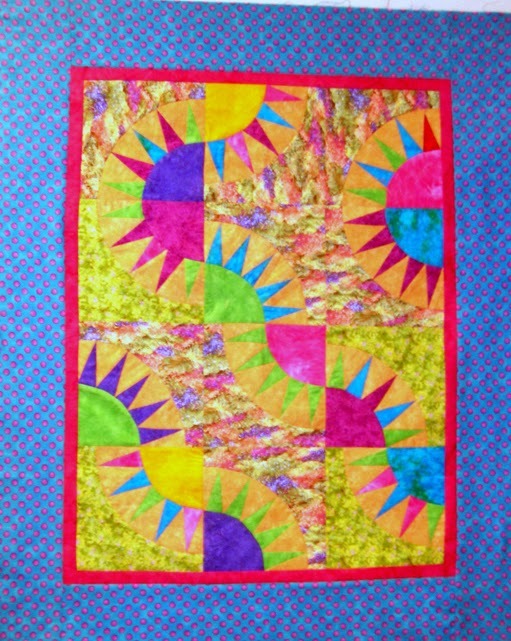 My dear friend Connie longarm quilted it a few weeks ago. Instead of wrapping it up, I had it hanging on my kitchen wall last night when she walked in. It took her almost 10 minutes to notice not only it, but the big sign with her name on it! Yes, she was speechless. That quilt is just as happy as Meg is. And you can bet that I had the greatest time getting it ready to go on its journey. I still have a smile on my face! Yes, these Gee's Bend quilts appeal to every generation. And the younger crowd see them as modern art. I see them as a bridge to span all ages. 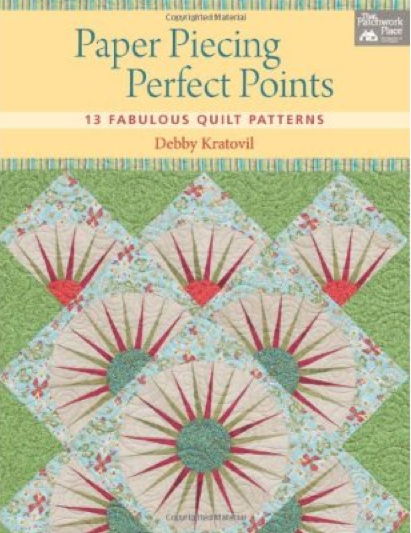 My publisher (Martingale/That Patchwork Place) suggested I post about my book, Paper Piecing Perfect Points. Besides needing a diversion from the 8" of snow we received on Monday, I also needed a happy quilt to feast my eyes on with a LOT color. Where is Spring? we are all asking!! 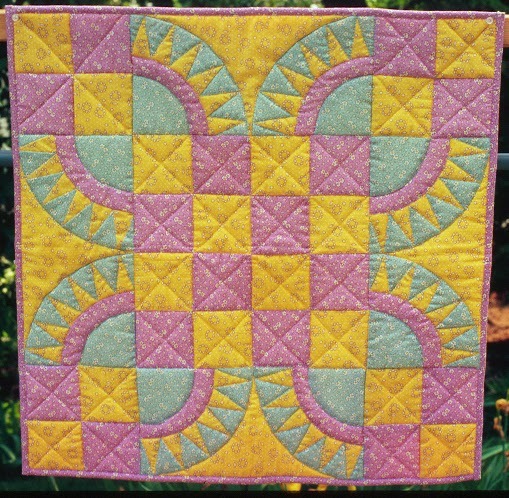 Sunflower Blossoms is really a remake of a quilt that was stolen in 2005 (along with 29 other quilts and samples). It was in a suitcase that was in a locked car in a "sketchy" parking garage in California. It was my first Dogwood Blossom quilt, based on a tradtional design and probably one of the first projects I made using foundation piecing. 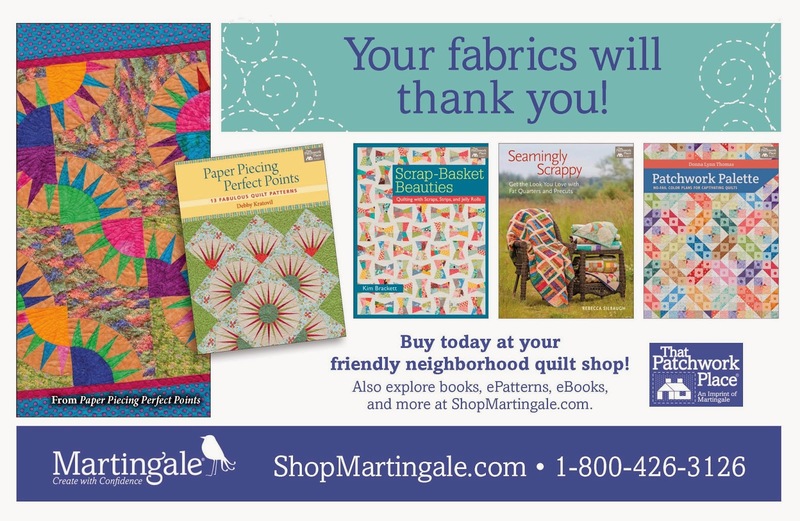 Print ad in a quilt magazine - Sunflower Blossoms! Yes, I know. Some of you are rolling your eyes. "Paper piecing? Are you nuts? I'd rather scrub toilets or go to the dentist!" All I can say is that you've never had a teacher to show you how easy it is and that you can get such awesome pointy-points no other way. Do you remember this post from the Nancy Drew Blog Hop? I made a quilt using Dogwood Blossoms in the center and the flying geese from Toile Garden in the outside. signed by the author (I think that's me!). Just go visit the Martingale Facebook page and check out all the beautiful projects and books they feature. Come back and tell me something that caught your eye (even if it's not paper piecing). 1. I have to have your email address, NOT a link to your Google Plus identity. No email, no chance to win. Not a link to your blog or web site. I am not a sleuth like Nancy Drew. 2. Contest is over Tuesday, March 25 at midnight. 3. Understand that I can't reply to everyone. I'm on the road for the next 4+ weeks and my dog and husband don't blog. But I LOVE READING all your comments! Log Cabins the Hexagon Way! 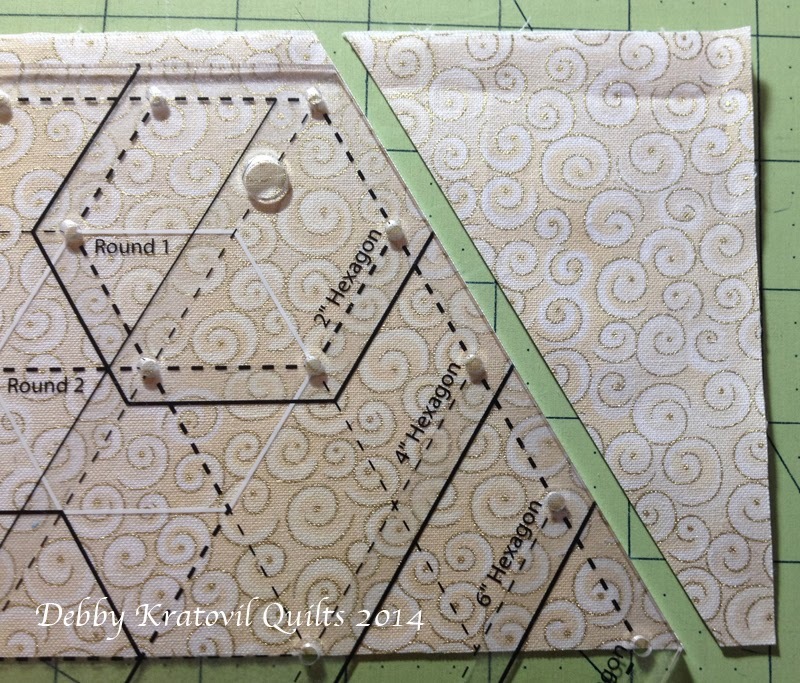 My longtime quilting friend and former editor at Quilt Magazine (I worked for her for 14 years) has developed several new quilting rulers for Creative Grids. 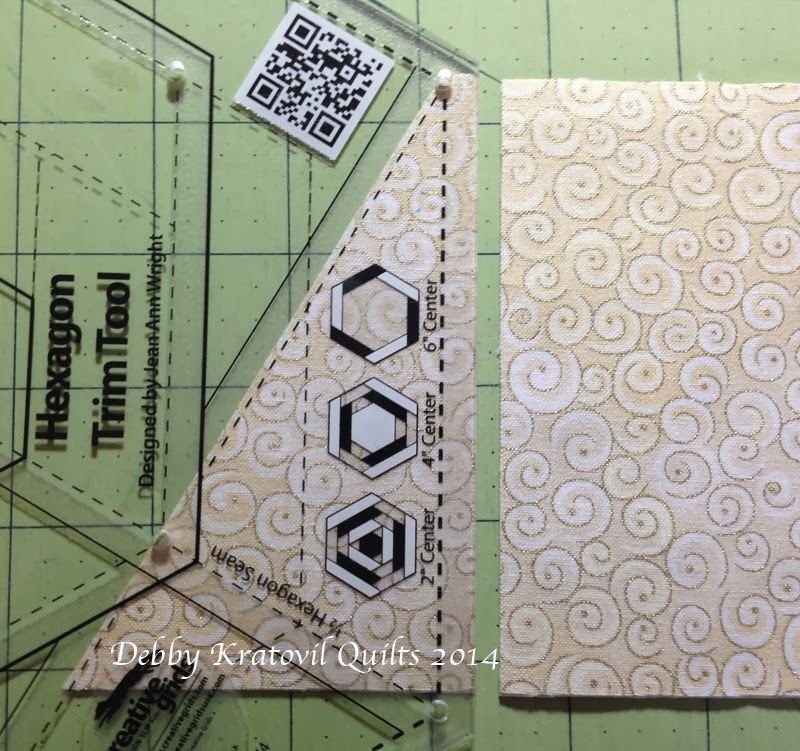 Jean Ann Wright has been quilting for a few decades and now has 3 trim tools that take the guesswork out of several awesome blocks. 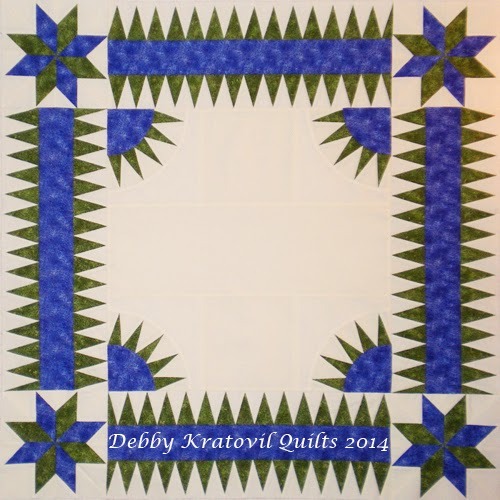 (I've been quilting for a few decades, too!) One of them is called the Hexagon Trim Tool. It makes an 8" (high) log cabin block in the shape of a hexagon. And you know how much I love hexagons! The beauty of this tool is that you don't have to cut the exact size strips. The ruler trims them for you after you've sewn an entire round of strips. I decided to make one this week to see if I could do it (what? are you kidding? this ruler is for everyone from beginner to advanced). I decided to "square it up" so that I can join other blocks without using a y-seam. How did I do that? Flip the ruler to make the second cut! These are mirror images of each other. These fabrics are from the Blank Quilting collection of blenders. 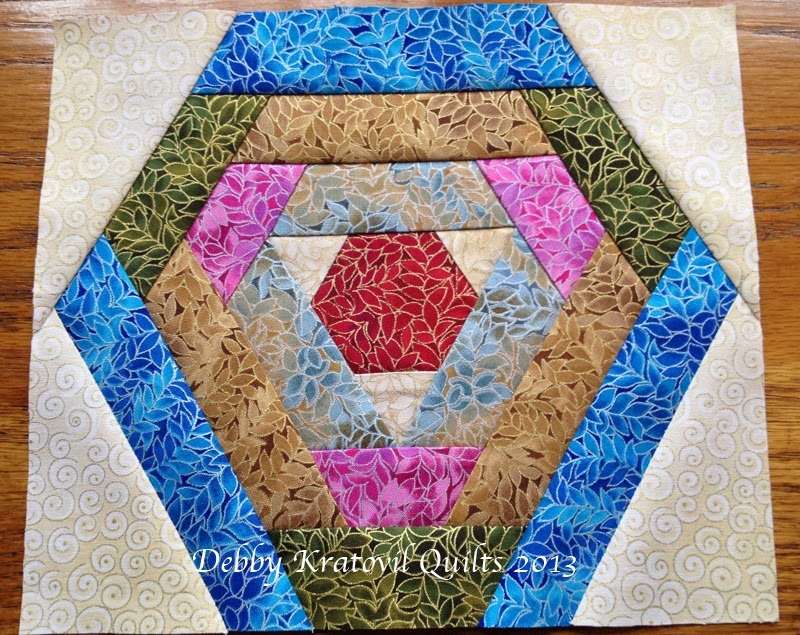 The fabrics are gorgeous and I hope to make several more of these blocks. I just needed one to take with me on the road to show my students. Stay tuned for more uses of this tool. 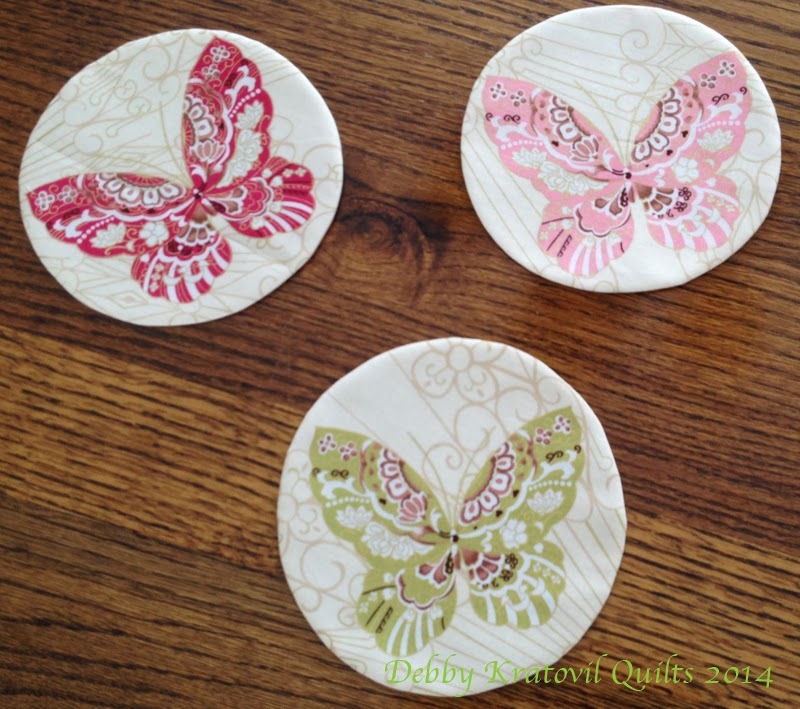 Today I am blogging at the Benartex site and give a great tutorial for how to make these lovely circles without any hand work. I put them into a small quilt that I hope will inspire you. Butterflies remind me of Spring. Are you coming, Spring? You can find out about the giveaway at the Sew in Love with Fabric blog. They will create the parameters for the contest. 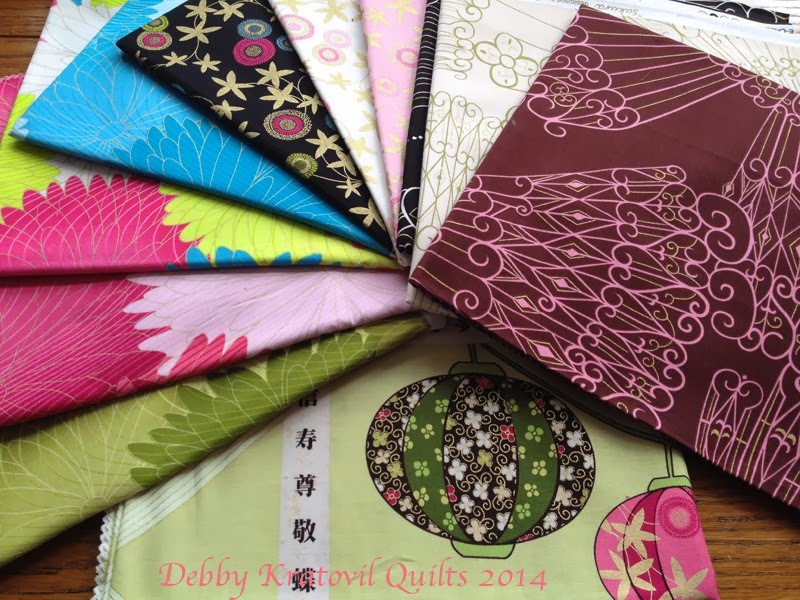 I will be giving away a set of fat quarters of the Sakura Collection. Good Luck! 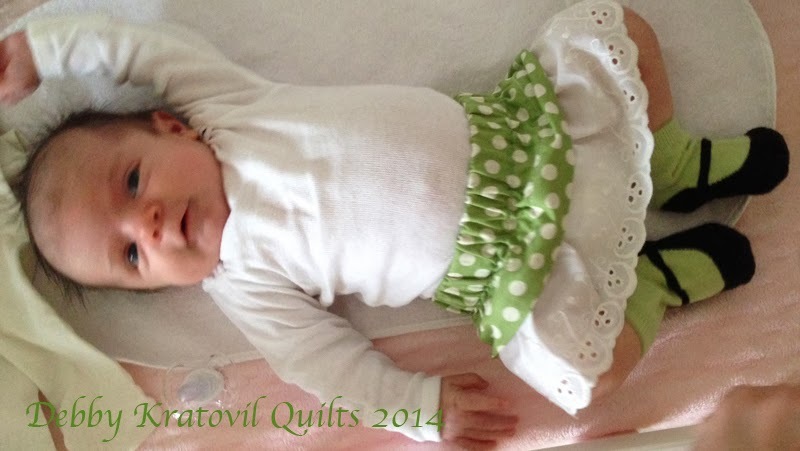 First attempt at a skirt for my 6 week old granddaughter! Welcome to my day for the Ruffles Blog Hop. Many thanks to Amy of Sew Incredibly Crazy and Madame Samm of Sew We Quilt. They do their best to keep us all in line. I spent several weeks sweating bullets over this hop. 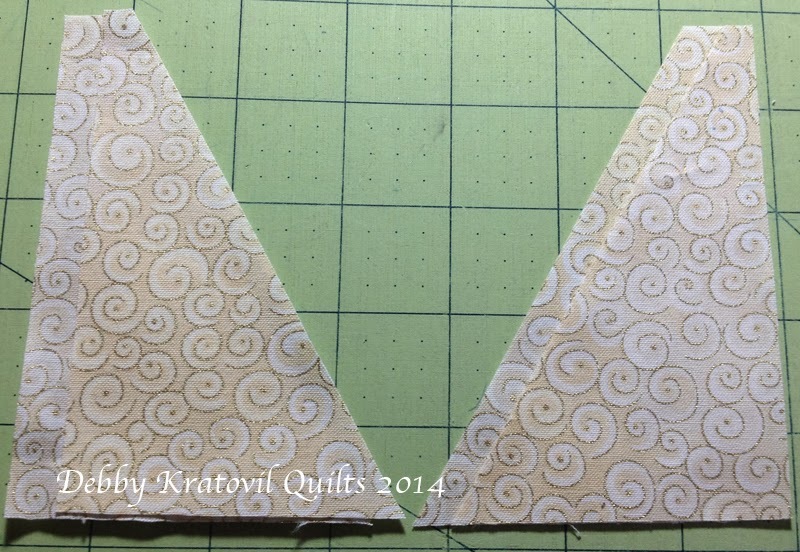 I didn't want to do another quilt, another pillow, or another apron. 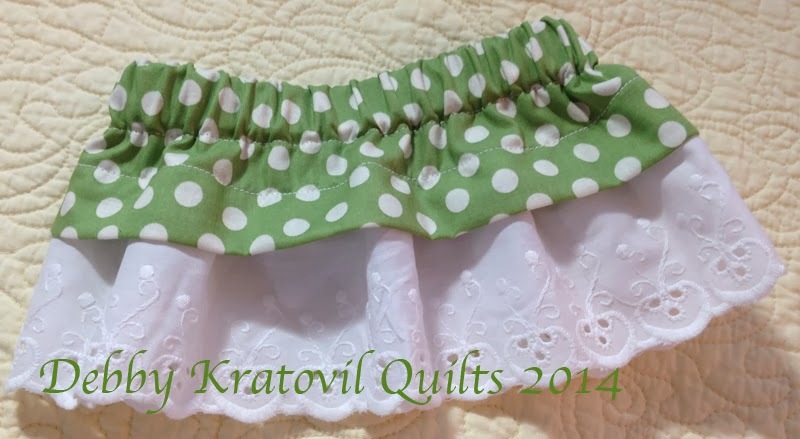 I got inspired by a tiny applique block I've had for years (I share it later) and then when my daughter Audrey asked me to make a dotted skirt for my new granddaughter Eva last week, well - I remembered the 10 yards of ruffled eyelet I bought at a thrift shop a few years ago. BINGO! The first skirt went down to her ankles. Ooops! Back to the sewing machine. Second skirt. More ruffle than fabric. Aren't I just the cutest little girl? And how about those shoe/sox? Audrey brought her friend Leah and her baby, who's about 6 months old. 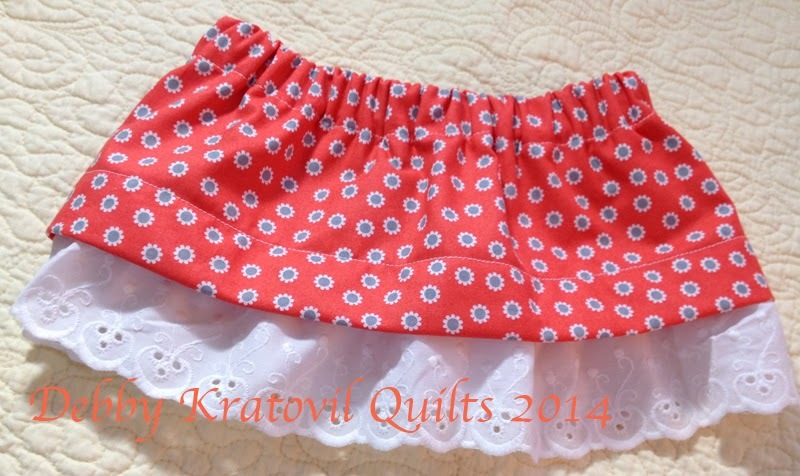 I made her a skirt in orange, with ruffles of course! Orange with the same ruffle. And what did Audrey and Leah make while I was busy making ruffled skirts? 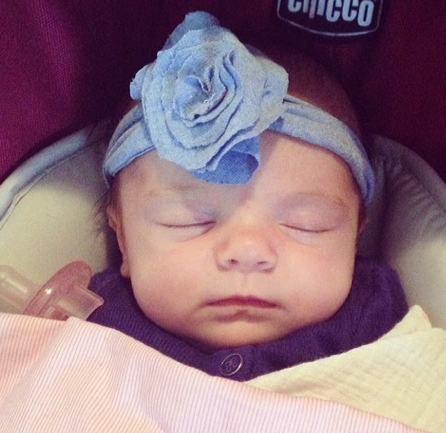 Ruffled headbands! This was my daddy's t-shirt yesterday. Today it's my ruffled headband! OK. Now to what I made FIRST with the little, tiny block I have had here for at least 15 years. 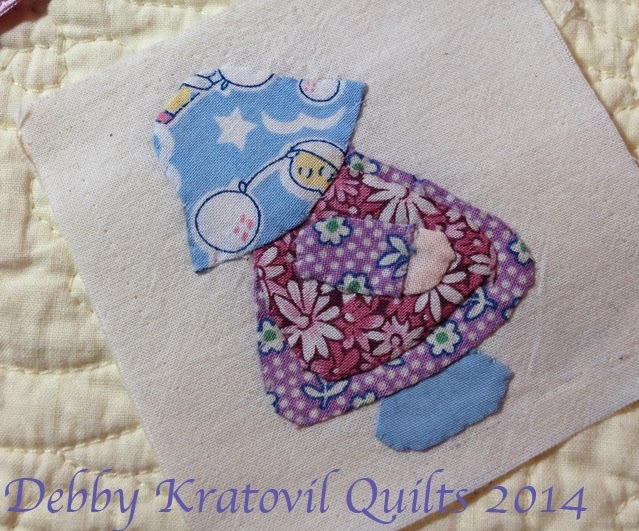 Tiny Sunbonnet Sue block, 3-1/2" square!